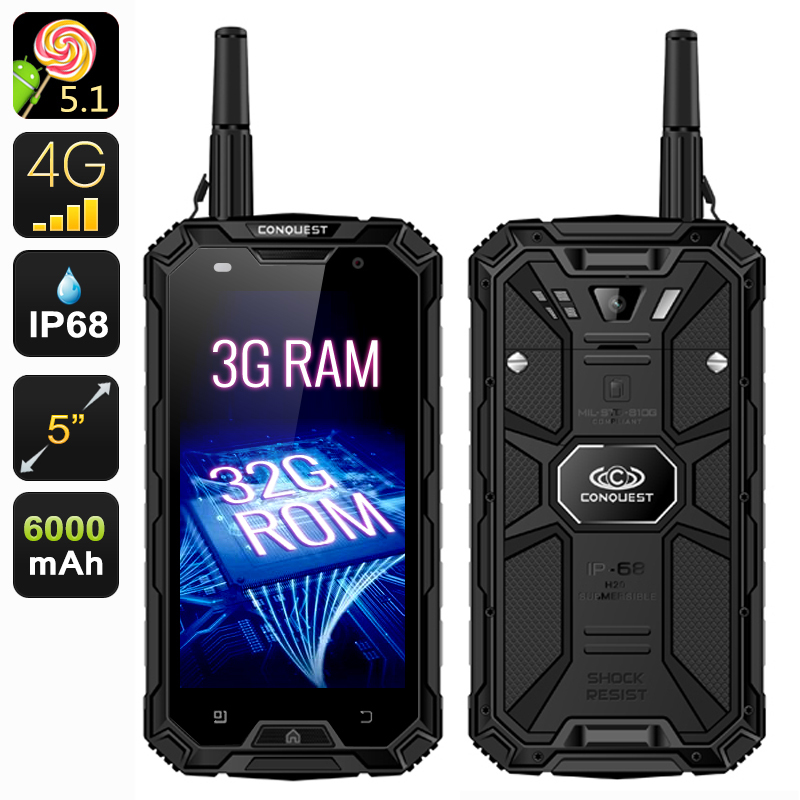 Successfully Added Conquest S8 Pro 3GB RAM Smartphone - 5 Inch IPS Screen, 4G, Android 5.1, Compass, SOS, NFC, OTG, Walkie-Talkie (Black) to your Shopping Cart. 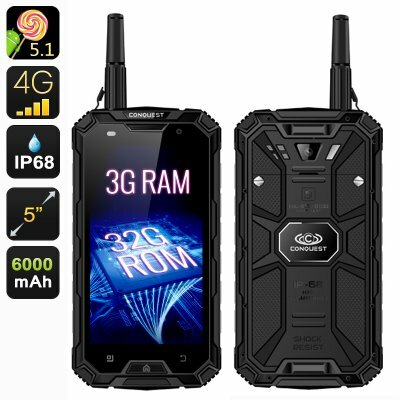 Take the fun outdoors with the Conquest S8 Pro 3GB waterproof smartphone, featuring IP68 and lots of additional functionality: GPS, walkie-talkie, compass, SOS and more. On top of that, the smartphone offers 3GB of RAM, 4G connectivity, Android 5.1 operating system and more. The S8 Pro 3GB smartphone is powerful, reliable and comes with lots of intelligent functionality. The phone’s rugged features are some of the biggest highlights. The phone comes with IP68 rating: dust resistant and waterproof. That means that it can be easily used outdoors in almost any weather conditions and would make the perfect companion for an adventure outing, hiking trip or sport. You will also have GPS and Compass for easy navigation, IR blaster to take charge of other gadgets, SOS function and more. The smartphone features a super large 6000mAh battery that is big enough to give you 16 hours of continuous usage time and a whopping 700 hours on standby. In addition to lots of rugged functionality, the smartphone comes with Android 5.1 operating system, offering a friendly and intuitive interface with access to the Play Store for all the extras. You will also benefit from 4G connectivity, as well as NFC and OTG for quick and efficient data transfers on the go. You will have 32GB of internal memory and the support of additional 32GB externally. With a 13MP camera, you will be able to easily snap pics of your surroundings and conveniently review them on a nice 5 inch IPS screen with 1280x720 resolution. The Conquest S8 Pro 3GB comes with a 12 months warranty, brought to you by the leader in electronic devices as well as wholesale Android Phones..